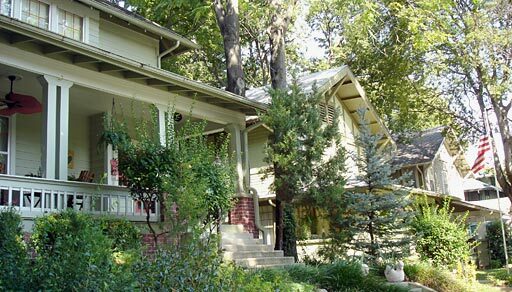 The Stonebraker Heights Historic District is a cohesive collection of leading architectural styles in Tulsa during the time frame of 1910 to 1922. The large number of two-story houses indicate that the Stonebraker Heights Addition was indeed one of “Tulsa’s most exclusive residential developments.” The district maintains a good degree of integrity, both in terms of individual buildings and neighborhood design. Dominated by the Bungalow/Craftsman style, the district also contains a notable percentage of Prairie School and Colonial Revival style homes. Overall, these styles are compatible in terms of size, building materials, feeling and association and reflect popular architectural trends of the period. Providing additional variety to the district is that even the houses classified as the same style are not identical. Thus, the Stonebraker Heights Historic District is an unreplicatable expression of period architecture in Tulsa. Several advertisements for homes in the Stonebraker Heights area in the late teens and early twenties make reference to available “modern servants quarters,” as well as note the presence of garages. Also noteworthy is that the garages in the neighborhood were not just single car edifices. A house advertised by the firm of Jenkins & Terwilleger in 1918 featured a two car garage and an advertisement run by the Blair Brothers in 1921 for a “…beautiful east front home…” noted the three car garage among the houses amenities. Stonebraker Heights was listed in the National Register of Historic Places on September 6, 2007 under National Register criteria C. Its NRIS number is 07000917.